These morsels are typically found in Jewish bakeries. 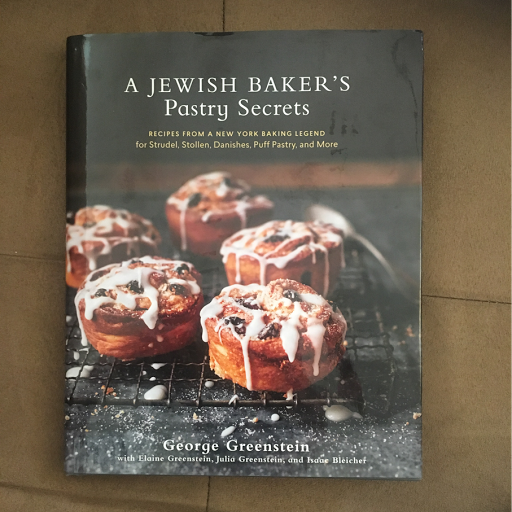 I'm using the recipe from George Greenstein's A Jewish Baker's Pastry Secrets. The recipe makes a dough with a very nice consistency and easy to roll out. 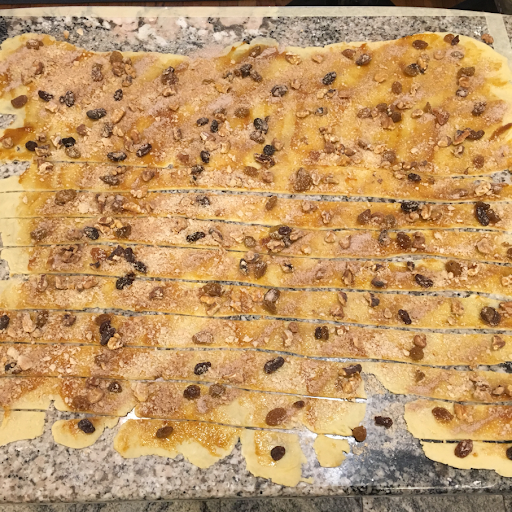 The recipe recommended working with half of the dough at a time, rolling out to 36"x20". 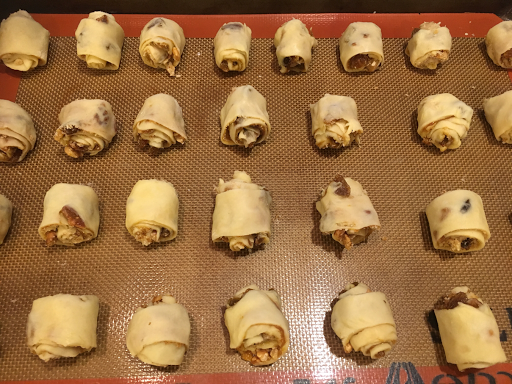 I don't have nearly that much counter space so I divided the dough into quarters and rolled them out to 18"x20". At this surface area the dough becomes translucent but still has a very nice texture without breaking. The liquid all comes from the small amount of eggs and the moisture in the cream cheese. I think the high amount of fat really prevents too much gluten formation. I think next time I will shape them into rounds and then roll out to rectangles. Starting with a rectangle made it hard to roll into a bigger rectangle. The apricot filling was made with dried Turkish apricots and the filling is wonderfully fragrant. I didn't have cake crumbs so I used bread crumbs instead, which worked just fine. There final step of brushing melted butter and sprinkling cinnamon sugar had to be done quickly otherwise the butter is absorbed too quickly to help the sugar adhere. 1. The dough is very similar to what's used in most major recipes. Most ones (Ina Garten, Martha Stewart, Serious Eats, Epicurious, NY Times, Smitten Kitchen, etc.) have the ratio of 8oz cream cheese, 8oz butter, and 2 cups of all purpose flour. Then the variations are in the presence/absence of egg yolks and sugar. The recipe I used has 12 oz cream cheese, 12 oz butter, 2 cups all purpose flour, and 1 cup cake flour. So the ratio is the same, except the gluten level is lower. It also has a higher water content because of the 2 eggs. I do think the moisture helps bind the dough together better. The problem with this particular ratio is that I end up with leftover cream cheese. 2. 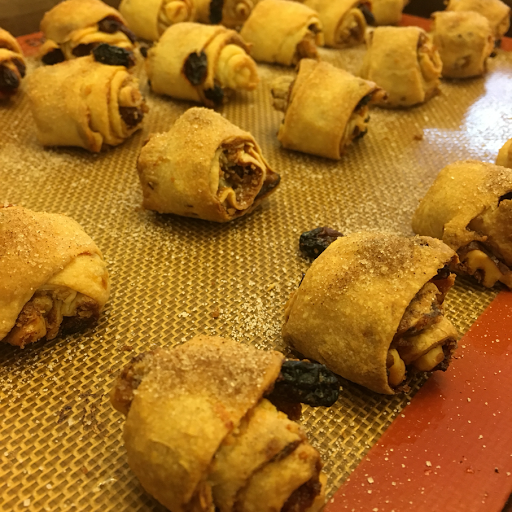 Most of the rugelachs I see in the store and in these other recipes have larger crystals of sugar on top. I think it gives a good crunch and different texture. Next time I will probably use larger crystals. And I might also consider an egg wash to give it more shine. 3. 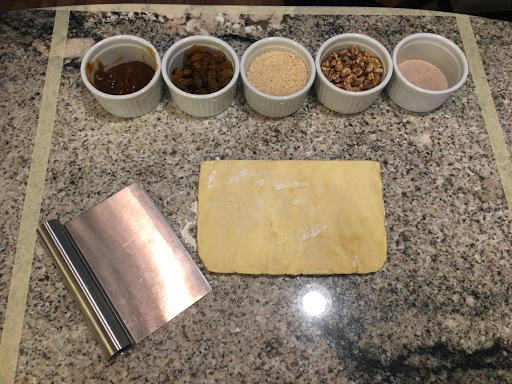 The original recipe says to roll the dough first to 20"x12", sprinkle the toppings, and then roll out to the full length. I found the dough to be way too soft for this method. The nuts and raisins tend to break through the dough if I followed this directly. I had much more success rolling out the dough fully followed by toppings. 4. I doubled the baking sheet to slow the bottom heating, which worked well because the bottom browned nicely.